We left at 11:00 pm on Sunday for another all night bus ride to Guadalajara, for the mesa de dialogo that the federal diputados were planning for noon on Tuesday (Nov. 22). About 75 people from El Rebalsito attended the event, along with maybe 100 (or more) others. It was quite a big deal - tarps set up for shade, a low platform for the diputados, several big tv screens that showed 2 videos from Tenacatita (including the one from the day the diputados came and pulled down the fence); the diputados had boxes with thousands of bumper stickers - EMILIO Regresenos Tencatita (Emilio - Give us back Tenacatita) and fliers. Before the event started we were in groups on all the nearby street corners - handing them out as vehicles stopped for red lights, and to people passing by. There were 7 federal diputados (from 3 political parties - PRI, PRD and PAN), one local diputado and a representative of the Human Rights Commission. No one from the governor's office came (even though it's right across the street), and he said that he never received an invitation. But the diputados had a copy of the letter inviting him and with a stamp and signature showing it was received by his office. 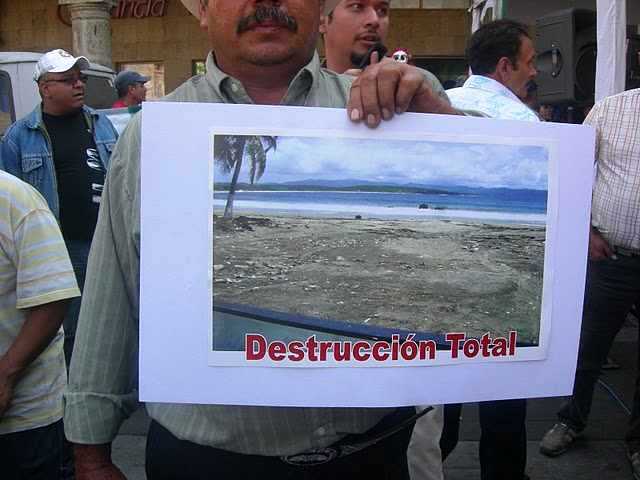 SEMARNAT (environmental agency) sent a letter saying they couldn't send anyone but supported the diputados in opening the road and the beach. And no surprise, no one from Rodenas showed up. So how can you have a dialogue, when two of the main parties involved aren't willing to meet? For the first time since the desalojo, I think everyone felt like the diputados really understood, and really wanted to see justice prevail. Each one spoke to a different effect of the desalojo, from the loss of homes, belongings, jobs, a whole way of life, to the insecurity, the lack of peace and justice, the effect on the children, to the condition of the state of Jalisco, where the governor is incompetent and does whatever he wants.... They were quite impassioned and almost all mentioned that this was a political issue, but not a partisan one. That the commission (composed of 10 diputados) wanted to uphold the constitution and the laws of Mexico, and they would take the issue to the Supreme Court if necessary. One lamented the fact that we came all the way from El Rebalsito, and no one from the governor's office would cross the street to take part in the dialogue.